For some reason they weirded me out. They are similar to potatoes... but orange? Weird. It wasn't until I did my first Whole30 in January of 2014, that I really started EATING sweet potatoes. If you aren't familiar with Whole30, it's a 30 day strict paleo challenge where you cut out all processed foods, sugar, legumes, dairy, grains, soy, and alcohol (it's kinda no joke). I quickly realized that without rice or white potatoes (when I did it, white potatoes were still restricted, this has now been added to the accepted list), I needed a carb alternative. At the time I was still working at Goldman, and was getting home around 9pm on average. This meant I had ZERO time or energy to cook fancy dinners. So I started baking sweet potatoes on Sunday, and pretty much haven't stopped since. Baking them literally requires no effort, and it's such a life-saver to have them ready during the week. Add these in and you'll seriously up your healthy eating game. Line baking sheet with tin foil. Wash potatoes, and place on lined baking sheet. Cut a slit into each potato (so they don't explode in your oven). Bake for 45 minutes and poke with a fork to see if they are done. 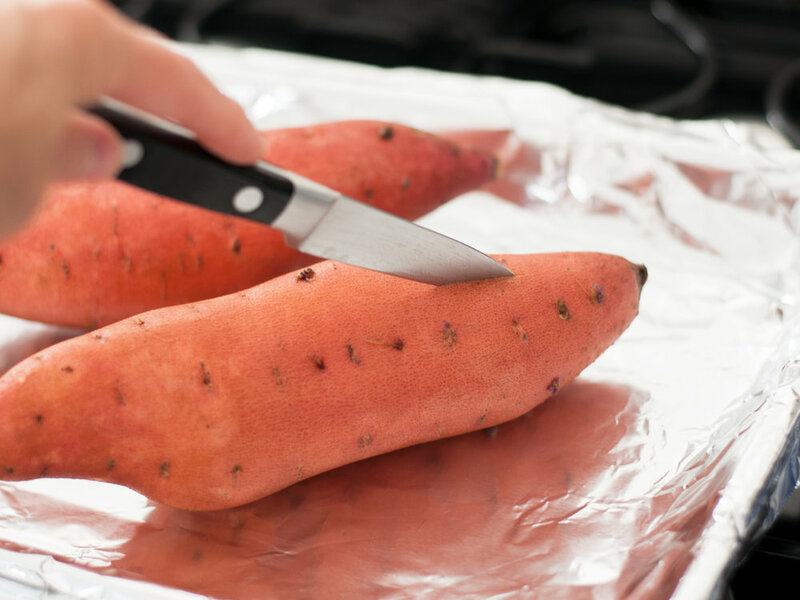 You may need additional time depending on how big your sweet potatoes are. Keep in mind they will also continue cooking for a bit after you remove them from the oven, so it's OK if they are a little firm. Let cool for about 30 minutes before storing. My favorite way to store them is to cut them into wheels first, makes reheating them later super quick and easy.